Have you ever experienced hacking of a website overnight that leaves you empty handed with no backups? Or ever tried opening an existing file and it gets corrupted all of a sudden? No worries, you are not the only one. There are many website owners who frequently get stuck with kind of problems on a daily basis. Having an online presence is a plus point to attract customers, but it is equally difficult to maintain its security. Poor security generally affects the startup business who usually don't have good data backups. This is where cloud hosting makes an entry. Cloud hosting solves all the problems regardless of your business size. As the data storage is multiplying every moment over the web, it becomes necessary to safeguard customers data at any cost. Cloud hosting lets you do that. It keeps the data safe by storing the data on a self-healing storage cluster, rather than managing the complete data over a single server. Cloud hosting lets you migrate the complete data over cloud where you can get quick data backups and retrieve the data easily. 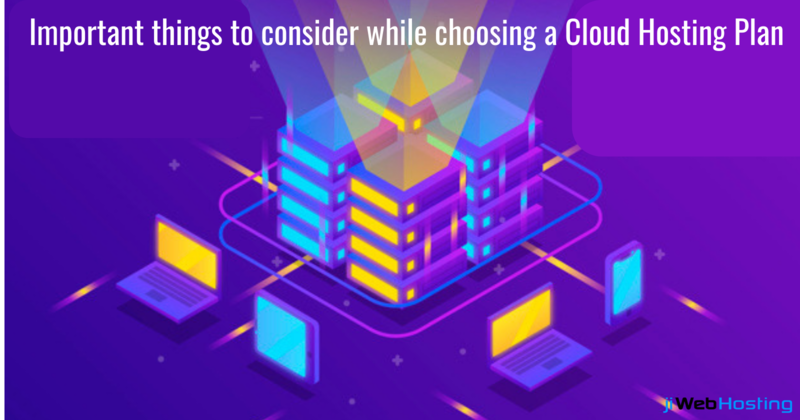 Once you decide to go for a cloud hosting plan, it becomes essential for you to choose the one that works right for your business. You simply can't visit the website, go through their reviews, and finalize it. Rather there are certain things you need to consider before choosing a cloud hosting plan. So, here are the top factors you must focus upon before making the final decision. Reliability: You must look up for a reliable hosting vendor which can handle robust bandwidth, data exchange and can offer better uptimes. You must ensure that if your website is entertaining huge traffic, the hosting plan must be able to offer better uptimes during the traffic hours. Easy to manage: The cloud hosting vendor must offer easy to manage services which can be easily operated by your IT staff. Having a complicated system makes you dependent on the support services. It is therefore important for you to go for the services which are simple and can be easily manageable on your end. Expertise: You must check whether the vendor holds a good brand name and experience in this field or is it just a new vendor dealing with the cloud hosting plan. It is good to choose the vendor who holds at least 10 years of experience in the hosting sector. Moreover, you can even check the past customers they are dealing with and analyze their feedback and reviews. Pricing: Some vendor might have cheap hosting plans for you but might not have a good experience and support services. You simply can't choose price over quality. It is necessary to invest proper time and ensure that the plan you have chosen fulfills your website requirements. Integration: While you migrate your website from your existing vendor to the new vendor, the migrations must be easy to carry out. If the task seems to be complex and time-consuming then you might be at the wrong place, it's time to look up for better options. Scalable environment: As your business grows gradually, so will your website requirements. You must ask your vendor about what all features and upgrades will be offered to you in future. Will they suit your business requirements or not? Get these things cleared in the first place and make a wise decision. How jiWebHosting can assist you? Want to get your website hosted from the most trusted and experienced cloud hosting provider? You can count on us. jiWebHosting is one such ideal hosting provider which offers the perfect hosting plans for your business at the most affordable prices. Can't believe? Try our hosting plans and experience our genuine services.